Out of all the novels, short stories, and poems we read in my Introduction to Literature class, I chose to write my final paper on Frederick Douglass’ memoir, Narrative of the Life of Frederick Douglass, An American Slave. Why, you ask? Well, precisely because of Douglass’ skill with language, to which the quoted statement above certainly attests. Despite being raised as a slave with no proper education, Douglass manages to teach himself how to read and write. He views literacy as the key to his freedom, a belief that certainly rings true. It is through these skills that he is able to eventually attain freedom and eventually tell his life story in the form of books. I love chiasmus adds depth to any statement, for it is both simply and complex all at once. In a way, the entire Narrative itself (and perhaps even Douglass’ life in general) can be viewed as a kind of chiasmus. Through hard work, determination, and courage Douglass transforms himself into a free man from decades of slavery. This reversal of identities mirrors the structure of chiasmus as it is used in writing, which may suggest why Douglass uses chiasmus so often in the Narrative. Taking a closer look at how books are written never fails to interest me, hence why I found Douglass’ writing so captivating. Another strength of his Narrative is simply Douglass’ life story itself. What a source of inspiration, not only for people facing racial inequality but for anyone encountering adversity in general. Pure ambition, drive, and bravery allow Douglass to become the person that the peculiar institution desperately tried to prevent him from becoming. His journey to freedom is heart-breaking, unsettling, and frightening at times, but it is also eye-opening, moving, and inspiring. Here is a man who broke the chains in which slavery imprisoned him, a man who proved himself to be arguably even more intelligent and human than the average white American citizen at the time. The only main weakness of the Narrative that stood out to me is the information that it omits. I understand that it is supposed to be an account of his story, but I would have liked to learn more about certain aspects of his life. For example, towards the very end of the memoir he suddenly reveals that along the way he had fallen in love and gotten married. When did that happen? How did they meet? It was an unexpected twist that seemed very out-of-place, and I think that more information leading up to it would give the reader a better picture of his life. 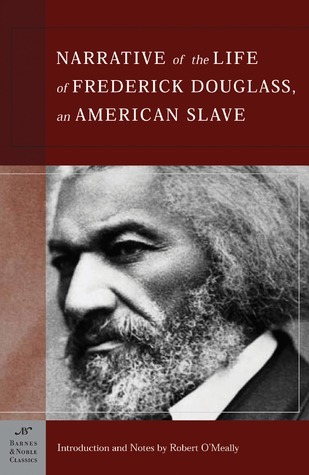 Overall, Douglass’ Narrative is my favorite piece of literature that I read with my Introduction to Literature class. It combines two of my passions: excellent writing and United States history. I would love to read more of Douglass’ work in the future, and perhaps even see the movie adaptation at some point. No matter what, though, I know that this Narrative will surely stick with me for years to come. Have you ever read this book before? What did you think of it? Did you like the movie version? Let me know in the comments section below! Great review and thanks for posting. It’s such an interesting book. I appreciate there are all sorts of pitfalls to using a personal memoir as a historical source but I still think this book has great power. Oh this book sounds gorgeous. I’m glad there are books like this one out there, and yes, hope definitely lies in education, but also in other things I think. And your review was splendid! Thanks so much! This writing itself in this book is stunning– it’s crazy to think that he taught himself how to write!